Well for a country which itself strives so much on tourism business, it’s a shame that we can be good hosts to other travelers, but when it comes to us, we are termed as worst travelers. A recent survey from the online travel agency Expedia had some bad news for Indian travelers: 4,500 surveyed hoteliers from around the world rated Indians as some of their worst customers — loud, fussy and cheap. According to recent news, international flight attendants hate coming to India and feel its worse to cater and serve Indian travelers. 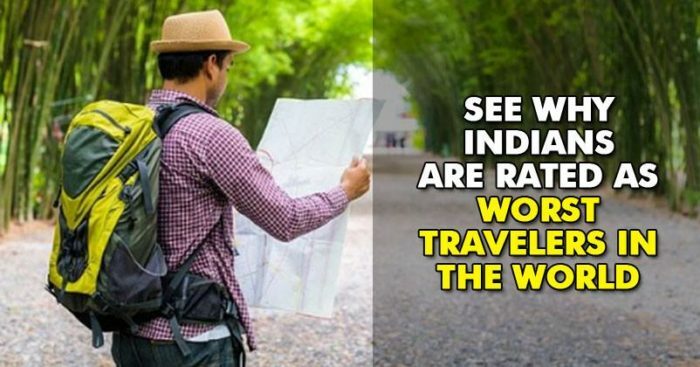 The absence of basic courtesy, manners, and way of talking is one of the prime reasons that make Indian travelers the most hated lot. What follows is their attitude. Having a servant, or maid at home and throwing tantrums is a common feature in Indian households, but sadly they carry this forward even when they travel abroad, so misbehaving and ill-treating waiters, taxi drivers, tour guides etc. becomes a natural part of their nature. Forget international, a lot of complaints are filed regularly even on domestic flights. Inappropriate touches, assaults, abusive language, picking on fights are a regular character of Indian travelers. Though not everyone does that like they say one rotten apple spoils the whole barrel. I think etiquettes and manners should be taught as a subject right from primary school, in order to inculcate these basics at a very young age. Dear education ministry, are you listening?